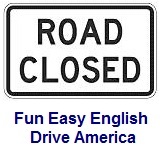 ﻿ Fun Easy English - Drive America - United States of America road signs, rules, and regulations warning, road. Warning road signs for narrow roads indicate width restrictions for the road ahead. Warning road signs for the temporary traffic control of narrow roads are used to advise road users of changes in the width of the road ahead. Warning road signs for road ends indicate the road ahead does not pass through to another road. Warning road signs for the temporary traffic control of road ends indicate the road ahead does not pass through to another road. Warning road signs for divided roads indicate whether or not the road ahead is divided. Warning road signs for the temporary traffic control of divided roads are used to indicate whether or not the road ahead is divided. Warning road signs for merging lanes advises the road user of a reduction in the number of traffic lanes in the direction of travel on a multi-lane highway or an increase in the number of traffic lanes in the direction of travel due to merging traffic. Warning road signs for the temporary traffic control of merging lanes advises the road user of a reduction in the number of traffic lanes in the direction of travel on a multi-lane highway or an increase in the number of traffic lanes in the direction of travel due to merging traffic. Warning road signs for the temporary traffic control of incident management are used when an unexpected problem occurs and traffic needs to be redirected as quickly as possible. These signs always have a fluorescent-pink background color. Warning road signs for the temporary traffic control of detours are used to advise road users of alternative routes around a construction area. Warning road signs supplemental plaques are used with other signs to provide additional information. Warning road signs for horizontal turns and curves are used to advise road users of changes in the horizontal alignment of the road ahead. Warning road signs for the temporary traffic control of horizontal turns and curves are used to advise road users of changes in the horizontal alignment of the road ahead. Warning road signs for road conditions give notice to road users of changes in road conditions that could affect the control of the vehicle. Warning road signs for the temporary traffic control of road conditions give notice to road users of changes in road conditions that could affect the control of the vehicle. Road will become more narrow. Bridge ahead is more narrow than the road. Bridge with only one lane ahead. Ramp will become more narrow. Road does not pass through to another road. Road ends and does not pass through to another road. A 90 degree turn to the left. A 90 degree turn to the right. A 45 degree curve to the left. A 45 degree curve to the right. Road curves to the left and then back to the right. Road curves to the right and then back to the left. A 90 degree turn to the left and then a 90 degree turn to the right. A 90 degree turn to the right and then a 90 degree turn to the left. All road lanes curve to the right and then back to the left. Road curves to the right, back to the left, goes straight, curves to the left and then back to the right. All road lanes curve to the right, back to the left, go straight, curve to the left and then back to the right. A 180 degree curve to the right. A 270 degree curve to the right. A 45 degree curve to the right with an intersection to the left. Road curves to the left. Highway will no longer be divided. Indicates the road will be split ahead. Indicates two way traffic ahead. Advises the right lane ends and traffic should merge to the left. Right lane is ending, traffic should merge into the left lane. Advises that traffic should merge to the left. Advises that the center lane is closed ahead. Center lane is closed ahead. Advises road users to expect merging traffic from the right. Advises road users to expect merging traffic from the right resulting in an additional lane. All traffic must use an alternative route to the right. Road users need to follow an alternative route. All traffic must use an alternative route. All traffic must use an alternative route beginning 1000 feet ahead. All traffic must use an alternative route beginning 300 meters feet ahead. End of the alternative route. Applies to the left lane. Indicates the paved surface changes to either a gravel treated surface or an earth road surface. Indicates the condition of the road might make travel more difficult. The shoulder, or area adjacent to the road, is made of a softer material than the main road. The shoulder, or area adjacent to the road, is at a lower elevation than the main road. The shoulder, or area adjacent to the road, drops quickly in elevation. There is no center road line separating traffic. Bridge becomes icy and slippery before the main road. The road surface is composed of loose gravel. There is an upcoming depressed surface in the road. There is an upcoming elevated surface in the road. There is an upcoming elevated surface in the road used to reduce traffic speed. Indicates that the road surface ahead is paved. Indicates that the road surface ahead is gravel. Indicates that the road surface ahead is sand. Adjacent lanes are at slightly different elevations. For the next 500 feet. For the next 2 miles. Traffic rules are photo enforced. For High Occupancy Vehicles (HOV) only. Bicycles are also using the road. The intersection of First Street is approaching. The intersection of Elm Street and Lumsden Road is approaching.